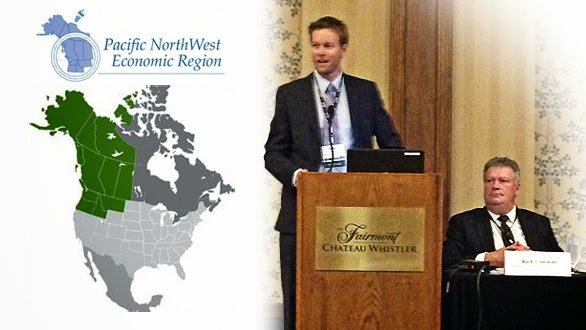 Brian Dracup, Senior Director, LNG Rail and Tender Program Development participated in a six person panel discussing natural gas for transportation as part of the Pacific Northwest Economic Region 2014 summit, held in Whistler this week. The panel was co-chaired by B.C.’s Deputy Premier, Minister of Energy, Natural Gas, and Mines Rich Coleman. At the conclusion of the panel, PNWER organizers stated they would form a working group of interested participants to discuss how to harmonize the way LNG is measured and how to make the way LNG is taxed common within the PNWER region. “Westport has significant knowledge on the ways in which government agencies can positively promote and accelerate the adoption of natural gas in transportation – something that relates directly to the objectives of the PNWER conference,” Brian says. Brian presented on the use LNG for mining and rail applications, and also reviewed Westport’s automotive, trucking and components products. Questions covered a wide range of topics around the use of natural gas for transportation. • When would an end user choose CNG vs LNG? • What’s the capital cost for a liquefaction plant? • How is LNG measured relative to diesel? • Do the bi-fuel pickup trucks switch seamlessly from compressed natural gas to gasoline or does the operator need to do something? • How is the Federal Railroad Administration working with the Association of American Railroads on the development of standards for LNG Tenders? • What’s the tax rate for LNG in B.C.? • More generally, how is LNG taxed in the U.S. and Canada on a federal and state level? • How do we harmonize the way LNG is measured across the U.S. and Canada? PNWER is a non-partisan, bi-national, public/private partnership in North America with a goal to strengthen relationships, find cross-border solutions to common challenges, and advocate for regional interests. Over 500 business leaders, legislators, and government leaders from PNWER’s ten states, provinces, and territories attended the summit to address the major policy issues impacting the region.